At a time when rightwing nationalism appears increasingly to be the only voice for the embattled union movement in the global north. At a time when there is a widespread misconception of union obsolescence given the historic ebb in working class organization. At a time when the left is confused and vague as to how it ought to deal with the immense transformations of global capitalism currently taking place with the rise of containerization, outsourcing, e-commerce, and the like. 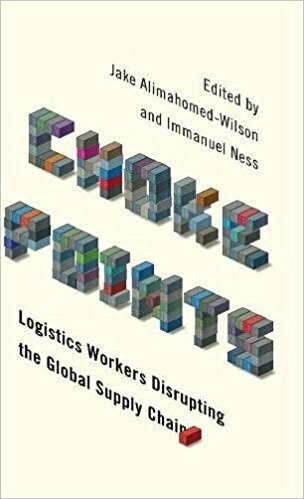 Choke Points, is a volume that gets straight to the heart of the problem and identifies ways that workers in the twenty first century can organize to take advantage of strategic nodes on global value chains. The volume begins with a series of chapters that cover three major theoretical bases – the academic, the political-economic, and the ideological. In chapter one, Sowers, Ciccantell, and Smith propose the ‘lengthened global commodity chain (LGCC)’ approach, in opposition to the neoliberally informed, ‘supply chain management (SCM)’ approach, which sees labor as a cost to be minimized, rather than a cause to be championed. In chapter two, Bottalico applies the LGCC approach to the European maritime logistics sector, mapping out a complete chain and identifying its implications for worker organization. And finally, in chapter three, Cole traces the ideological continuity of Pan-Africanism and Left-Internationalism displayed by the Durban dockworkers of South Africa. In the second part of the volume, organizational aspects are taken up across various global ‘choke points’. In chapter four, Ruixue and Yu delineate the ‘triple front’ faced by Chinese dockworkers (state, capital, region) which I must note, ironically mirrors the ‘Sansonwenti’ (three dimensions of agrarian struggle) faced by Chinese peasants. In chapter five, Reese and Struna explore the implications of the “Amazon effect” on warehouse workers in Southern California, in particular the rise in their strategic power. In chapter six, the united Amazon workers of Poland contribute much needed voices on the ground, delineating the many dimensions of exploitation which new logistics sector workers face daily including stress, isolation, exhaustion, and cabin fever. And finally, in chapter seven Alimahomed-Wilson and Potiker illustrate the way in which racialization, militarization, and imperialism combine to form a lethal cocktail for Palestine’s truckers, who nonetheless continue to resist in creative ways, using, for instance, underground tunnels to circumvent US-Israeli drones. Their daily existence remains nonetheless, fraught with danger. In the third part to of volume, port cities are dealt with in detail, beginning with the Indian port city of Mumbai in chapter eight. Minz identifies two processes (privatization and containerization) that have thrown the city into a virulent transitory phase over the past few decades. Similarly, in chapter nine, Parsanoglu and Philipp identify privatization wrought by the Greek debt crisis as a major source of change with ominous implications for workers in the Greek port city of Piraeus. Saez and Valenzuela also trace a massive rollback of Allende era social reforms in the Chilean port city of Valparaiso in chapter ten. And finally, Shahin and Tepe outline some of the ways Turkish trade unionists have been both stemming the tide of this neoliberal turn, and leveraging the changing conjuncture to their advantage, in chapter eleven. In the book’s final part, new organizational strategies, not at specific choke points but in a more general sense, are taken up. First, Mufakhir, Pelu, and Panimabang delineate the ways in which emergent labor organizers have built up solidarity among truckers in post-Authoritarian Indonesia, which still suffers from a legacy of (not so)quasi-fascistic repression to this day. In chapter thirteen, Kaoosji warns against over optimism, especially in the global north where imperialist rents exert a significant depoliticizing influence, but maintains that the basic strategy of leveraging choke points and involving the wider community (which he himself has practiced for several decades now) holds. IN chapter fourteen, Benvengnu and Cuppini explore the impact of migration, anti-union policies and rising inner city precarity on grassroots organizing within the Northern Italian context. And finally, in chapter fifteen, Peter Olney, ex organizing director of ILWU (international longshore and warehouse union) of the western USA – one the most consistently left-internationalist, radical unions in the country – shares his insights from over forty years of organizing experience. One of the most striking themes that emerges from this diverse set of case studies and theoretical treatises, is the juxtaposition of continuity and change. On the one hand, logistics sector labor movements have displayed, and have benefited tremendously from, a consistent history of left-internationalism. This, in addition to the practice of leveraging ‘choke points’ to bring down the entire chain, has been one of the key ‘force multipliers’ that has allowed relatively small unions, in strategic hamlets, to exert unparalleled power over capital. Peter Oleny’s statements and Cole’s tracing of Durban Dockworker internationalism/Pan-Africanism, bear testament to this. However, equally continuous has been the internationalism of capital, that is, the unrelenting constancy of imperialistic underdevelopment, and the way in which it is perpetuated through the logistics sector. Alimahomed-Wilson and Potiker for instance, illustrate the way in which Palestinian logistics workers are forced to use the outdated “break bulk” method by Israel’s ‘back to back’ system of checkpoints. Minz shows that Indian logistics sector workers are similarly ‘locked in’ to a backward position in the world system as ‘just-in-time’ delivery necessitates ever increasing levels of stability along the chain. Backwards India must not be allowed to move up, lest suburban shoppers be forced to forgo one-day shipping. These dimensions of continuity are juxtaposed against rapid exogenous changes like containerization (which has increased the ‘positional power’ of logistics workers) and what Reese and Struna call, the ‘specter of automation’ (which is daily decreasing the ‘positional power’ of logistics workers). This juxtaposition implies that there are certain theoretical theses and organizational strategies, such as underdevelopment and left-internationalism respectively for instance, that still hold, and should not, as it were, get ‘thrown out with the bathwater’, but at the same time, even new strategies, like organizing workers at specific choke points, must not be conceived as ever-lasting. As Peter Olney emphasizes choke points are ‘not forever’. Two major strengths of this volume stand out. First, it precludes what E.P. Thompson called, “theory with a capital ‘T’”. In calling, at the outset, for a radical reformulation of the problematic in the form of the LGCC approach (as opposed to the SCM approach), the book sets out a clear objective toward which all subsequent analysis should work, and indeed, for the most part, does work toward. That is, the identification of challenges and opportunities for worker organization along the various ‘choke points’ on the supply chain. This clear equivocation allows the volume to skip over unnecessary details irrelevant to worker organization (which the rival ‘global value chain’ (GVC) approach often falls into), and the misconception of labor as a cost to be minimized, rather than as a cause to be championed (as the ‘supply chain management’ (SCM) approach falls into). A second major strength of this volume is its bringing in voices from the ground. From the united Amazon workers of Poland, to the extensive in-depth interviews utilized in analyses by Minz, Alimahomed-Wilson &Potiker, and many others, the immense value of these voices, revealing the hidden ways in which exploitation immiserates logistics workers, and the insights that on-the-ground people have to bring to the academics in the classrooms, is truly impressive, and mirrors – happily – a growing trend in left publishing generally. Yet there is at least one major weakness that the otherwise excellent volume falls prey to, and that is the neglect of the primary sector. Despite the lengthened GCC approach espoused in the beginning of the book (‘lengthened’ as in extended to the primary sector where raw materials are extracted), there is a heavy emphasis on warehouses, ports and transport workers. One that in my view is wholly unjustified given the many parallels between what workers at these nodes are facing, at what peasants further up the value chain are contending with. Flexcropping for instance, mirrors the ‘flexible’ logistics of just-in-time delivery. Mechanization of mining and farming mirror the ‘specter of automation’ facing warehouse workers. And the fact that peasant movements like MST, La Via Campesina, and COAINE, have had arguably more success than logistics worker’s unions, despite lacking their strategic ‘positional power’ over choke points on the value chain, suggests that peasant movements may have something to teach the logistics workers in terms of organization, while the latter surely have much to teach the peasant’s unions about exploiting strategic ‘choke points’. Ultimately however, this is a fantastic volume that powerfully introduces class-conscious chain analysis to academics and activists alike. As Marx himself said, ‘people make their own history, but not as they please’ if we are to turn the advents of the twenty first century – containerization, outsourcing, globalization, financialization, militarization of the middle east etc. – into leverageto push forward the historical project of emancipation and the universalization of human dignity, then we must, as this volume readily does, grasp the dual task of putting academics to the service of emancipation, and informing activism with theory rather than dogma, with both hands. This wonderful collective effort has the power to unite workers around the world, across the chain, and from the classroom to the street. May it be widely assigned and read! Alimahomed-Wilson, J., & Ness, I. (2018). Choke Points. University of Chicago Press.